Google has reportedly started rolling out a revamped version of the ‘My Apps & Games’ srction on Google Play Store. The new interface aims to make it simpler for users to manage their apps & games. The feature is currently not available for all Android users, and Google is slowly rolling it out in phases. The new interface offers more options to organize your apps based on size, alphabetical order, last used, and last updated. 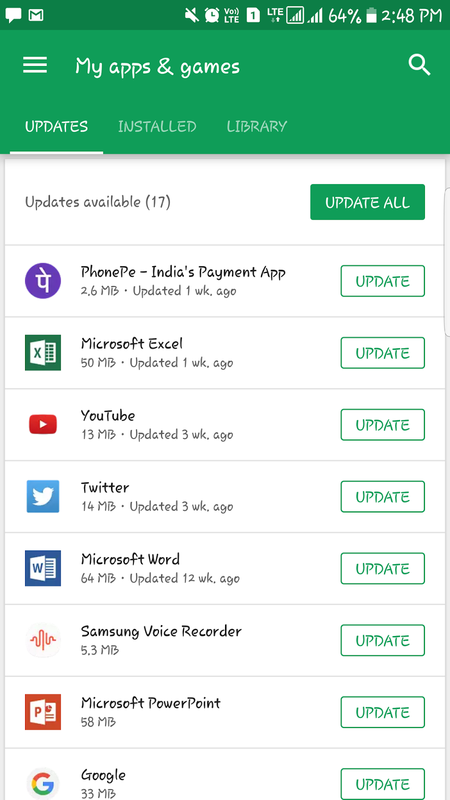 The refreshed design also gives you an account of how many apps you have, and the ‘Updates’ tab next to every app will now tell you the last time that each app was updated. There’s also an ‘Installed’ tab that will tell you the last time that you used each app along with the size of each app or app update. Another advantage of this update is that users can check for updates instead of having to leave the Play Store, and launch the app again. The update also makes the icons on ‘My apps & games’ section smaller, which is a boon for smartphones with smaller screens. It also helps Google fit more apps in the limited screen space, and the user gets more information about the app.